My father-in-law is a lover of hot rod art. Ed "Big Daddy" Roth is his own Picasso, and I must admit Roth's little creatures do hold some appeal. When I was a child, I owned a friction toy that included a rubber monster of Roth's creation. That toy is long gone, and as a child Roth's name held no meaning for me. 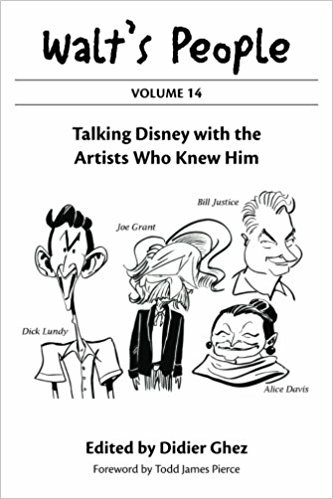 Shooting ahead twenty-some years, Roth, unbeknownst to me, came back into my life in the form of a Disney artist. That's right! Ron Dias. The artist and friend I have talked so much about brought me full circle to the land of Roth. During one of our two hour phone conversations years ago, Ron and I stumbled onto a conversation about Roth's work. "I did some little things for CarToons Magazine back in the 60s," Ron told me. I was more than familiar with the magazine. My father-in-law had been watching quite a few issues on eBay at the time. 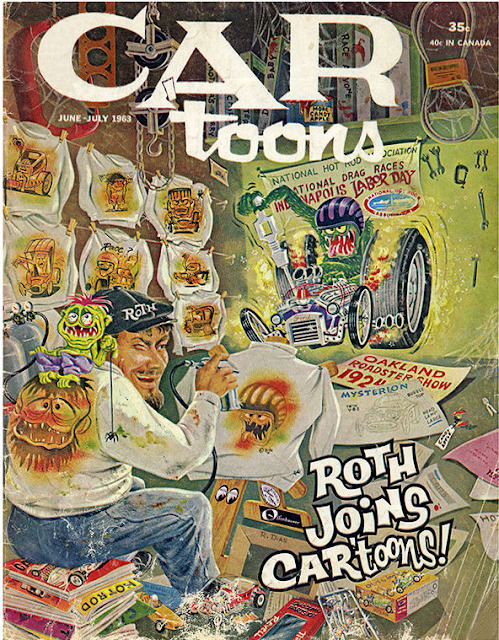 Ed Roth's characters appeared on the covers of several issues. Ron went on to tell me that he not only did some of the covers (such as the title picture above), but record covers featuring Roth's monsters as well. I was floored! What a small world! 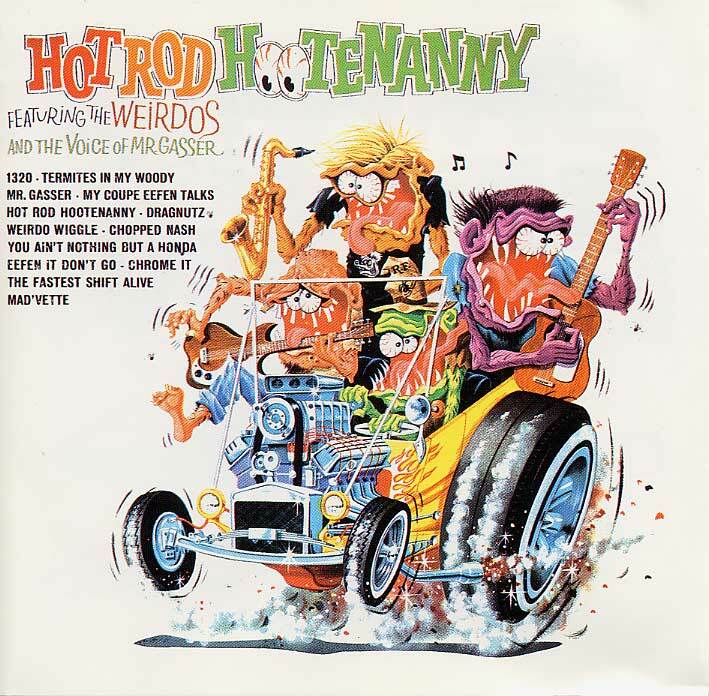 Here was a man that was as Disney as you could get (picture Mr. Blue Bird on his shoulder), and I find out that he did art in the style of "Big Daddy" Roth! Father of the Rat Fink!? The degenerate, drunken relative that Mickey Mouse never talked about??? I was familiar with several record covers that Capitol released in the mid-60s featuring Roth's cartoon monsters. Ron described one with a Rat Fink riding a surfboard. "If you look closely in the waves," Ron revealed, "you will see my initials." 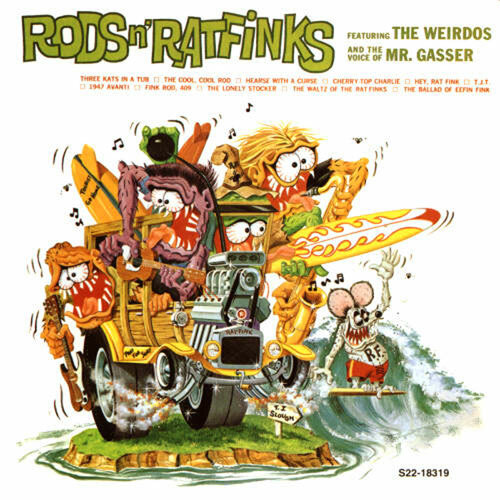 With a quick image search on the web, I found the record art to "Rods N' Rat Finks" (1964). Within the waves is a distinct "RD". Roth didn't create the illustration, Ron Dias did! I bought a rereleased version of the record and the two others in the series. Ron recalled another record cover that he did which included the song "Termites in my Woody," This was the "Hot Rod Hootenanny" (1963) Capitol release. Ron wasn't 100% sure that this latter record cover benefited from his touch (he just remembered the "Woody" song), but I'd put my money on it. The style is so similar to "Rods N' Rat Finks" that it must be. I've looked at the cover a dozen times, but could not find the signature "RD". The cover(s) below are a testimony to Ron's versatile abilities. He was in his late twenties at the time, and on his way to Hanna-Barbera. The first below is from 1963 and the second from '64. Here is a list of my book publications to date. Click on a picture of a book to order. "It's the Stay Puft Marshmallow Man!" David High Ain't Afraid of No Ghost!